Ominous shadows, amplified sounds and moving patterns on the walls and floor: These are things that dementia patients can experience. People without the condition can now learn about the problems those with dementia face by using a virtual reality (VR) application. 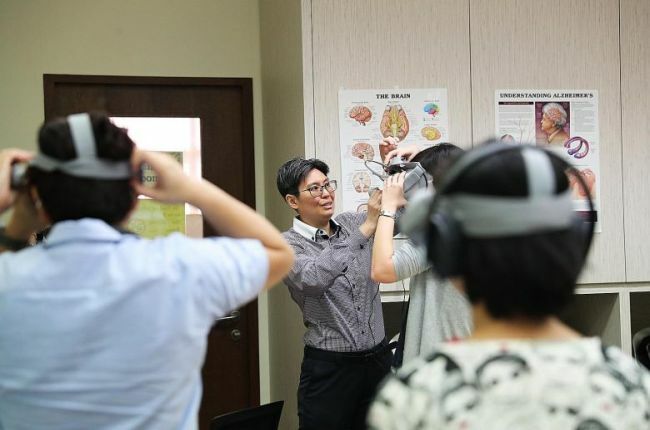 The Educational Dementia Immersive Experience, or EDIE, is being used in Asia for the first time as part of a three-hour workshop taught by the Alzheimer's Disease Association (ADA) to help healthcare professionals and the public understand dementia. Participants in the pilot workshop yesterday wore headsets and earphones that enabled them to see and hear from the perspective of a male dementia patient in his early 60s who was being cared for by his wife. They went through scenarios of finding their way to the toilet in the early hours of the morning, before and after improvements for dementia patients were made to the home. Around 82,000 people aged 60 and above here have dementia, according to the Well-being of the Singapore Elderly study by the Institute of Mental Health in 2015. "Many people think that dementia is only memory loss and forgetfulness (but) there are other symptoms, such as loss of sensory and visual perception, resulting in them having difficulties identifying objects in familiar environments," said ADA chief executive Jason Foo. "We hope that this virtual reality platform will present a more effective way to help someone see through the eyes of a person with dementia, reduce the stigma, design and create care environments that are enabling and better support the well-being of persons with dementia." The application, which is also available in Australia and Canada, was developed by Dementia Australia in 2016. It was the first to use game technology to create the virtual world of a person with dementia. Participant Tony Kee, 50, said that the workshop helped him to empathise with his 83-year-old mother-in-law, who has moderate dementia. "The workshop helped me to see the world of people with dementia, and understand and empathise with them," said the insurance agent. "It's not that they want to make life difficult for you - they would do it themselves if they could - but sometimes, we as caregivers don't know and think that they're trying to create havoc." ADA hopes the app will attract more than 1,000 users, including staff from hospitals, senior care facilities and the social service sector, as well as educators and architects. It also plans to develop localised scenarios within three years. More information on the workshop, which costs $120 per session, will be available on ADA's website from next month.